You'll be £6.00 closer to your next £10.00 credit when you purchase Superfoods. What's this? Everyone deserves a balanced and organic diet, for good nutrition and the right remedies can really make a difference. Superfoods explores the exceptional results certain foods can have for your general health, from fighting off the signs of ageing to preventing cancer. Discover a wide array of fruits, vegetables, grains and more, all with their own bedazzling health benefits - free from chemicals and full of goodness. To help readers to envisage how all of these foods can be used, Superfoods provides utterly delicious recipes for each and every food mentioned - see just how simple it can be! Eating superfoods helps to maintain a healthy body and a healthy mind. Upon doing so, you will notice a difference in your skin, and feel a real difference from within yourself. 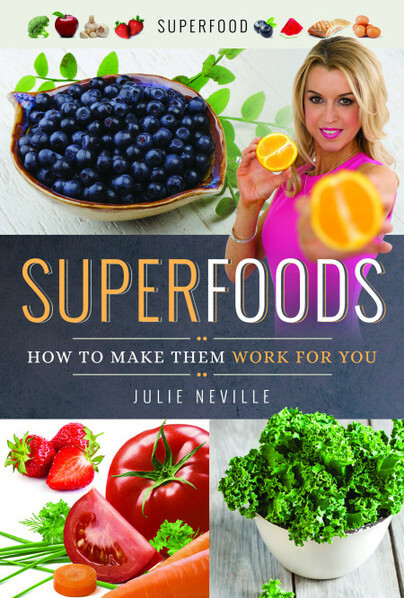 Julie Neville discusses the health benefits of removing chemicals from your diet and listening to what your body needs, as well as how eating organically was shaped by her own life experiences. This delightful book demonstrates the pleasures and ease of keeping a natural and chemical-free diet and lifestyle. Be healthier and happier; learn how to eat for your body; how to remove chemicals from your diet, and still indulge, and most importantly: how to feel genuinely superb. Julie Neville is a nutrition specialist who has the passion and desire to make healthy and organic food available to everyone; her approach to healthy, organic living has often been featured on television: ITV and Lorraine and in the press: The Telegraph, The Sun, The Daily Star, Daily Mail, Vegetarian Living Magazine. During her career she has worked with a number of Premiership football clubs, several Championship clubs and the England National teams, as well as a number of elite athletes.